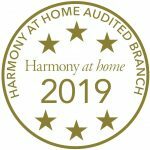 We really care about what we do, that’s why all our Harmony at Home independently owned Branches have to demonstrate through an Audit of their processes and a test, that they meet our best practice guidelines. This includes customer service and customer care along with ensuring that the requirements as set out by the Recruitment and Employment Confederation code (REC), and the requirements of Employment Agencies as set out by the UK Government are met. The Audit of processes is conducted at random once a year at an unspecified time. It is followed up by our in house team of experts to evaluate and asses the results. A branch not meeting our process guidelines will need to make changes and will be re assessed, until they pass. Along with our Audit of processes, we require all members of our team to complete a compliance test once every year. The test carries a pass mark of 80% and evaluates the branch knowledge of best recruitment practice, and how we can keep our standards of professionalism high. A branch not passing our test will need to make changes and will be re assessed, until they pass. Each branch displaying the ‘Gold Standard’ Rosette has passed the Audit and has shown excellence in their service level, and high levels of compliance to the REC code. If you have a concern or would like to raise complaint we have a Policy in place. If you have a complaint about a Harmony at Home Branch, we encourage you to raise any complaint directly with the Branch owner in the first instance. If you are not happy with the response from your Branch, please see the link below to our Complaints Policy, enabling Harmony at Home to investigate your complaint through our complaints procedure. Please note that we are unable to accept complaints about events occurring more than a year ago and anonymous complaints. Our Complaints Policy requires a full disclosure by the complainant. This means that both parties will read each others submission. The information given by both parties is held in accordance with Data Protection. Harmony at Home Complaints Policy. As an organisation we are registered with the Information Commissioners Office (ICO), and have comprehensive policies and procedures to follow to safeguard the personal data of all our clients and work seekers in line with GDPR. All our independently owned Branches are also registered with the ICO, and have their own Data Protection policies. If you have any questions about Data Protection, please contact our Data Protection Officer who will be pleased to help you. Harmony at Home believes that a child or young person should never experience abuse of any kind. We have a responsibility to promote the welfare of all children and young people and to keep them safe. We are committed to practice in a way that protects them, and have a Safeguarding and Photography Policy in place. Harmony at Home Safeguarding Policy. Harmony at Home Child Photography and Sharing Images Policy. As an organisation using the Disclosure and Barring Service (DBS) checking service to help assess the suitability of applicants for positions of trust, Harmony at Home complies fully with the code of practice regarding the correct handling, use, storage, retention and disposal of certificates and certificate information. It also complies fully with its obligations under the Data Protection Act 1998 and other relevant legislation pertaining to the safe handling, use, storage, retention and disposal of certificate information and has the following written policy on these matters in place. Harmony at Home Code of Practice for registered persons and other recipients of DBS check information.